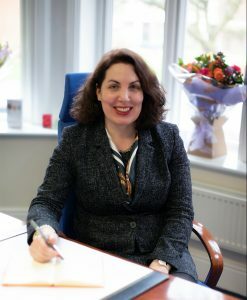 The start of the Summer Term has seen the exciting arrival of Claire Tao, the new Headmistress at Merchant Taylors’ Senior Girls’ School. Prior to her new role, Claire worked as a deputy head at the City of London School for Girls, one of the top ten performing schools in the country for both A-levels and GCSE’s. She started her career in investment banking in 1993 and holds an MSc in Personnel Management and Industrial Relations from the London School of Economics. She worked as an assistant director of HR for NatWest Markets up until 1997 and then Citibank. In 2003, after having her children, she retrained as a Biology teacher completing her PGCE qualification at Roehampton University. Claire has 13 years extensive experience across a wide range of roles within independent schools, beginning at Old Palace of John Whitgift School in Croydon and then Dulwich College Preparatory School before joining the City of London School for Girls in 2007. Talking about her appointment, Claire said: “It is a real honour to be joining the Merchant Taylors’ family of schools and to be taking the reins at such an exciting time. Asked if she had any changes planned at Merchant Taylors’ Girls’ School, Claire said: “I think most people will expect my focus to be on results, but it goes beyond this. I will be looking to strengthen the school’s curricula and create a collaborative and equitable learning culture that will enable our girls and staff to perform to the best of their ability.